I recently realized something - I have years of experience running internet marketing campaigns for clients that weren’t on HubSpot, and I also have years of experience running campaigns for clients using the HubSpot tool. So why not share those results here in an effort to help other business owners who may be considering using HubSpot? Seems like a big Duh! Doesn’t it? So here I go. But first, a quick story. When I founded OverGo Studio we, actually I - at that time, were doing inbound marketing for our clients but didn’t even know it was called inbound marketing. I also wasn’t aware of a tool called HubSpot. I remember our first full inbound client, a financial services firm in NY. We basically duct-taped a bunch of tools together - Dreamweaver, Wordpress, Google Analytics, MailChimp, Some Forgotten Keyword Research tool, HootSuite, and a few others. We started to get great results for this client and as word of mouth spread other companies wanted us to do this magical blog thing, capture lead thing, followup thing with automated email thing for them, too. Great - right? Well...not really. The amount of work involved in using all of these independent tools and then trying to figure out the reporting and analytics made it completely too expensive for most small businesses and I love working with small business owners. I figured hey, I can’t be the only one with this problem. Someone must have figured this out. So I started Googling (love that it is a verb now) around. I stumbled on HubSpot - the answer to my prayers. That is when I also found out that there is a name for what we were doing and it is called Inbound Marketing. Great I can stop calling it “blog thing, capture lead thing, followup thing with automated email thing”. But now I had to explain what Inbound Marketing was to my clients - oh well. We immediately began using HubSpot for ourselves as a test. After about six months we brought it to our first client. From there we eventually brought it to all of our clients. Initially some came on but many did not. So we have many stories and data from clients that did not use the tool, as well as data from those that transitioned over. As of this writing all of our clients are using the HubSpot tool. So, why did I just tell you this story? Well, to be frank - to establish some credibility. Now you know where the data that I am about to share with you comes from. To compile this data we took a sampling of fourteen clients and placed them into two groups, seven clients using the HubSpot Tool and seven clients not using the HubSpot tool. Each group includes a selection of B2B and B2C companies across a diverse range of industries. All of these companies fall into the small business classification. To make this an apples to apples comparison, each client included in this report published the same quantity of blog posts over the 12 month period measured. And each client included in this report received the same level of inbound marketing services. For each client we measured organic traffic at the start of their inbound marketing program and then took another measurement exactly twelve months later. We also measured their lead generation during the same twelve month period and further broke this into separate groups of B2B and B2C companies. To be able to share this data without revealing any private information we aggregated it together. Like most business owners you have probably heard by now that blogging is the number one way to generate organic traffic to your website. Publishing new articles on your website every week will garner you better placement with the search engines. You may have also heard that the best blogging platform is WordPress. So why would I need HubSpot to generate traffic? After all, we generated a ton of traffic just using WordPress for our first client without ever using HubSpot. Well...yes but we also spent money on a keyword research tool and many hours of labor doing the actual research. Another thing to consider is that today’s content marketing landscape is much more competitive because everyone is doing it. Let’s look at some of the real world results that I promised to share. Below is a chart compiling the traffic growth of fourteen of our clients during the first twelve months of working with us. For each company in this study we were posting two blogs per week. We grouped the results by clients that were using HubSpot vs. those that were not. 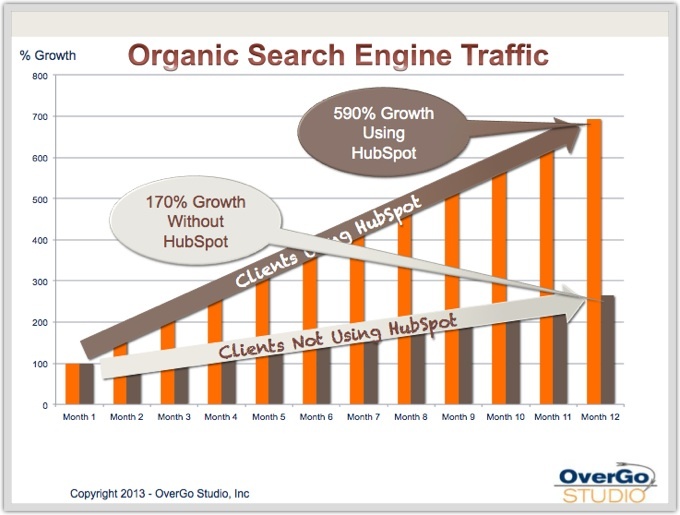 The companies that did not use HubSpot had an average increase of 170% in organic traffic at the end of 12 months. Not bad. But, the companies that did use HubSpot had an average increase in organic traffic of 590%. Wow - big difference! So let’s look at what HubSpot brings to the table that the Google and Wordpress free tools do not and how that actually impacts your website traffic. The first question you face when it comes to blogging is - "what are you going to write about?" or more accurately what are you going to write about that you can actually get listed by the search engines for. Ranking opportunities is a great feature inside HubSpot’s keyword section. It shows you what keywords you have an opportunity to get ranked for on the first page of a search. It does this by looking at where you currently rank versus how competitive the keyword is, and then makes recommendations on blogging. Conversion opportunities is another feature also inside of HubSpot’s keyword section. This shows you what keywords are driving a lot of visitors but not converting into leads, giving you ideas for opportunities to get these visitors to convert. Long-Tail Opportunities shows you some keywords that are hard to rank for, but for which you can add a word or phrase to turn them into long-tail keywords and get ranked for them. Competitors is a great feature that shows you which of your competitors is ranking better than you and on which keywords. It also compares the rank difference between your site and theirs, along with the search volume. This really gives you an understanding of what needs to be done to compete. The Campaigns feature of HubSpot allows you to organize your keywords into campaigns to track and measure your progress. So how does this compare with the free tools in Google Analytics and Google’s Keyword Tool? Well...as you may have guessed or experienced, they are not available. You can get a list of keywords, their search volume, and how difficult they are to rank for, but no data on how your site is ranking and nothing on your competition. You certainly get no recommendations on what actions to take or what keywords to blog about. If you are a sophisticated analytics geek you may be able to cobble together a couple of free tools to get some of this information, but not many of us are, and our time is valuable. The impact on traffic generation is big. With HubSpot you have information that your competition most likely does not have access to. Armed with this information you can confidently create and execute your content marketing strategy much more efficiently. To compare lead generation between those using HubSpot and those not using HubSpot we looked at a one year period and calculated a monthly average to adjust for seasonality. We sampled the same group of companies used in our organic traffic analysis. To make an apples to apples comparison (at least as best as we can) we grouped the companies by B2B and B2C. 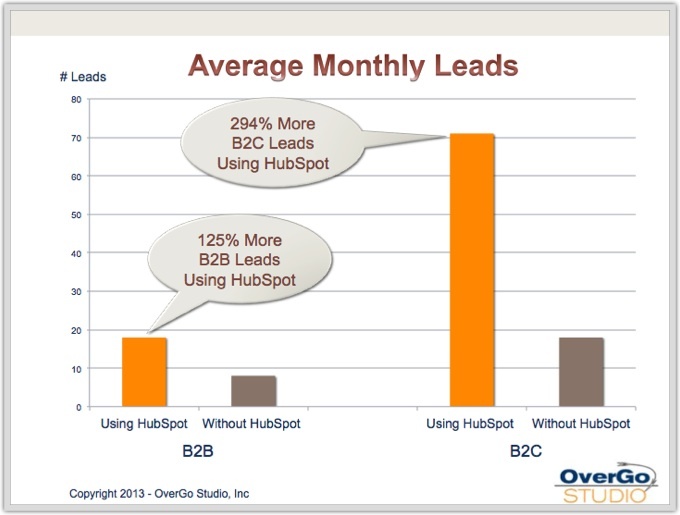 Our B2B clients not using HubSpot averaged 8 leads per month, while those using HubSpot averaged 18 leads per month. Our B2C clients not using HubSpot averaged 18 leads per month, while those using HubSpot averaged 71 leads per month. Note: We have a high percentage of clients that hunt multi-million dollar deals as such they get very few leads. That is why the average lead numbers may seem somewhat low. Also these are monthly averages during the first twelve months of inbound service, and most of the clients had zero leads during the first few months. The B2B and B2C companies using HubSpot received 125% and 294% more leads respectively than those not using HubSpot. It is worth noting that several of the companies in the B2B HubSpot sample are “whale hunters” (looking for $million+ deals) and naturally have low lead conversions. 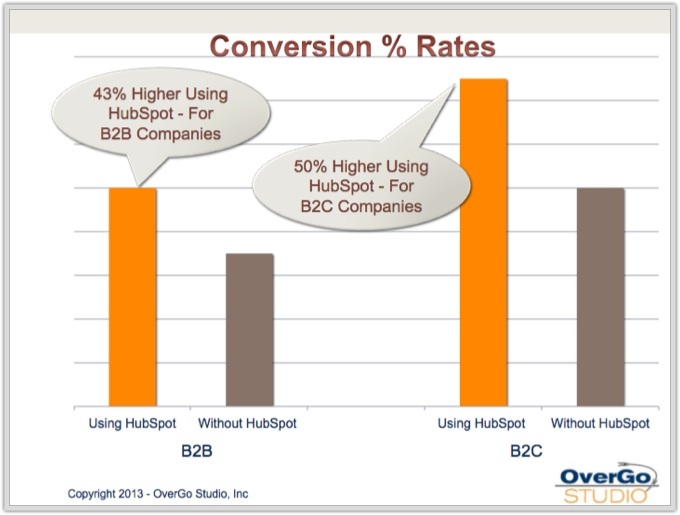 Without them in the sample the percentage increase for the B2B companies using HubSpot would have been even higher. Ok...so... if you're the skeptical kind you may be saying to yourself "Of course they got more leads - they had much more traffic." After all, we showed in the organic traffic section that they had a 420% increase above and beyond the increase in traffic than our non-HubSpot clients experienced. Well then, to level the playing field let’s look at lead conversion percentages. What is this jargon you say? In plain english, we are going to take the average number of leads and divide them by the average number of web visits. For example; if for every 100 visitors to your website you get 1 lead you would have a 1% conversion rate. Okay - let’s go. Our B2B clients using HubSpot had on average a 43% higher conversion rate than our B2B clients that were not using HubSpot. Our B2C clients using HubSpot had on average a 50% higher conversion rate than our our B2C clients that were not using HubSpot. This is worth re-reading as it is pretty important. To be frank I didn’t expect to see higher conversion rates for the HubSpot clients. I say this because as you drive more traffic to a website a good portion of that traffic tends to be unfit for your offers. With a large increase in traffic you will get more leads but generally you will also see your conversion percentage decrease. The fact that the conversion percentages actually increased speaks volumes to the tools available inside of HubSpot that assist with website conversions. I will go into them shortly and how they assisted in improving conversions even in the face of soaring traffic. If you chose to read no further (in this epic blog post - sorry) I at least want you to understand the importance of conversion percentage increases and what it means to your business. If you look at your website as a lead generating machine for your business, then there are two major controls. The first is the lever that drives traffic to your website. The second control is the dial that determines what percentage of that traffic becomes leads for your sales team. Imagine having your hands on both controls and being able to increase traffic while at the same time increasing the percentage of leads. This has a compounding effect. Let’s look at an example. Say you have a 2% conversion rate and 2,000 visits per month. This means you get 40 leads per month. If you double your traffic and stay at 2% you will have 80 leads per month. But if you double your traffic and increase your conversion rate to 4% you will have 160 leads. Let’s move on and detail the reasons our HubSpot clients experienced increasing conversion rates while their traffic also increased. The HubSpot Calls-to-Action (CTA) Manager tool. What is this, you say? Well this little tool inside of the HubSpot system manages the graphics on your website. More specifically the images that say things like “click here to get this incredible white-paper that will blow your socks off” and stuff like that. So why does this get us more leads? Well... this allows us to upload multiple versions of different images and they are automatically served to visitors and tested for not only which one gets the most clicks, but more importantly which one leads to the most conversions. We then replace the loser with another contender. This tool gets us to click-thru-conversion nirvana in a very short amount of time. Recently HubSpot has added a Smart CTA feature to this tool which can detect if a visitor has responded to the image before, and if they converted it then shows them something different. It can even do this by detecting interests or sales cycle stage of the visitor to show them appropriate content. So how can you do this with a free tool like Google Analytics? You can’t really do this. You can do A/B testing of entire pages but not individual elements within a page like an image or CTA. And it won’t show you conversion percentages by CTA either. It also has no way of intelligently changing content based upon your visitors history and interests. You will also need a programmer to setup a Google A/B test for your site. It is not as simple as clicking a button like it is in HubSpot. HubSpot’s Landing Page Manager tool allows you to launch and customize landing pages very quickly. Research data has shown that the number of landing pages your website has correlates to the number of leads you will generate. This tool combined with the built in A/B Testing and the Form Manager Tool makes is very easy to quickly generate landing page tests and offers. You can do this using some free tools like MailChimp or several other mail list service providers by combining their forms to your static landing pages and then integrating Google’s A/B testing tool. 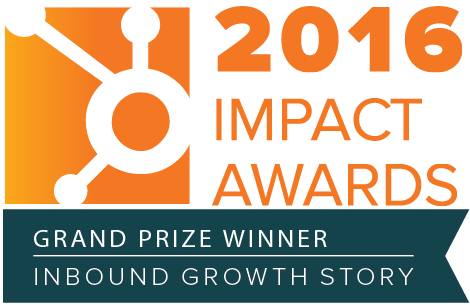 This is not easy to do but we did it for our clients that did not use HubSpot. What you can’t do is segment your leads into what we call dynamic smart lists. This brings me to the Smart Lists Tool within HubSpot. Smart Lists automatically update themselves by moving contacts from list to list based upon any rules you wish to create. In practice this means you can segment your audience by sales cycle, interest, or many other attributes and as they return to your website they will be updated in your lists as to their current interest or status. This allows you to automate some very targeted email campaigns. This feature is not available in any free tools. Using targeted emails and smart lists allowed us to perform better lead nurturing and thereby create more leads for our clients using HubSpot. Lead Nurturing/Email Marketing. We used MailChimp and iContact for our non-HubSpot clients. HubSpot has a built in Email Marketing tool that is just as robust, but it also fully integrates with the above mentioned tools and many more if you wish to use them instead. The difference with using HubSpot is that as I mentioned in the prior paragraph it allows the use of smart lists which give you a much more focused and effective email campaign - leading to higher conversion rates. By using smart lists, you can start workflows which will automate different tasks for both the marketing and sales department. You can also use other triggers to start workflows, but we find using smart lists allow for a more targeted experience. This automation improves your team's efficiency and helps push your leads along the sales cycle. Thus helping your sales team close faster. Workflows can complete many different tasks depending on user activities and submitted information. From sending lead emails to alerting sales reps of certain lead actions, a good workflow automation can boost your revenue by empowering your team. 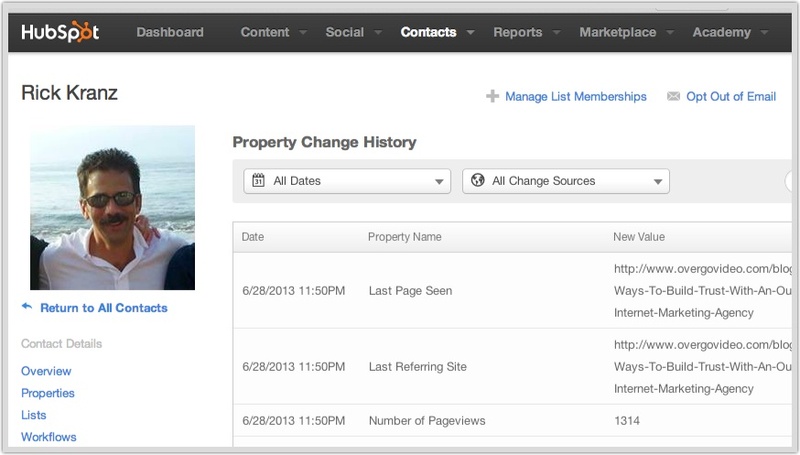 You can learn more about workflows by reading our blog "How To Set Up Hubspot Workflows." This article shows you the process of setting up a workflow and offers a few examples of how you can use them. Another great way to help with lead nurturing is by using smart content. Smart content allows you to deliver a more personalized experience on your website or by email depending on specific criteria you know about the contact. This allows you to tailor your message to match the prospect's wants and desires. Hubspot does this by dropping cookies on your contact's browser, then you can set up specific rules to show certain messages or content to specific groups of people. This too can help push your contact along the sales cycle. Okay this is starting to sound like a list of HubSpot features. I am not trying to do that. I am just calling out some of the tools that gave us better conversions for our clients using HubSpot (a paid tool) vs. the group of clients using the free tools. Lead Capturing with HubSpot vs. Free Tools is a very big item that nobody really talks about much. For our clients not on HubSpot we used the aforementioned iContact and MailChimp forms to capture leads into those databases. Here is the problem with that; when you look at your Google analytics it tells you that you got 40 leads this month from paid, 60 from organic search, 30 from referrals, etc. but it doesn’t tell you who they were. It only gives you anonymous info. When you look at your MailChimp database you see that Bob Jones became a lead on a certain date but it doesn’t tell you what the source was or which campaign or keyword he used to find you. Also the numbers never match. You see 90 leads in your email database yet analytics fired off 130 conversions. Huh - what gives? Why is this important? Well...to generate traffic and leads you are running different campaigns, email, paid search, social media, blogging, etc., and if you don’t know where Bob Jones came from how can you tell which campaigns are working better than the others. Let’s take this one step further. After two months 20 of the 90 leads from two months ago became customers. Now you want to know which campaigns sent the most customers. Good luck. No way to tell that. Here is the big difference: Using HubSpot each lead’s history is complete with what campaign they came from, keyword, and what they viewed. So we could look at any point in time and see which campaigns were sending the most qualified leads. We were also able to update the lead by sales cycle status, i.e. marketing qualified, sales qualified, opportunity, customer, etc. We can then run reports on which campaigns sent the most opportunities or customers. This also allows us to report ROI for each campaign. Oh... and the numbers always match. 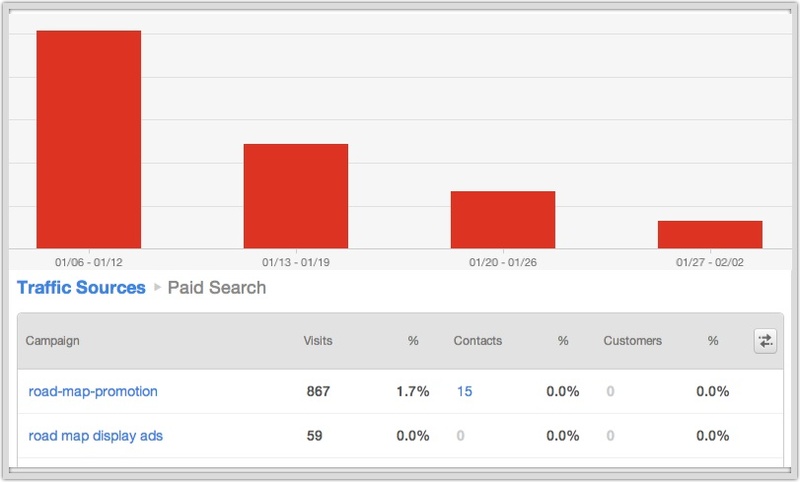 If HubSpot says there were 60 conversions from paid search you can actually click into it and see the 60 individual people. Nice! By having this information easily available we were able to shift resources to the most effective campaigns and stop the ineffective ones. This allowed us to generate more leads as well as higher quality leads with the same amount of marketing dollars. Which brings me to one of my last points about using a paid tool like HubSpot and that is how much more effective the Adwords campaigns were vs. those clients on Google Analytics. As I detailed in the previous section, armed with information like who ultimately converted to a customer and which campaign and keyword brought them in allowed us to make our clients' Adwords campaigns much more effective. This is not information you can get from either Adwords or Google Analytics. To put this in perspective - for one of our clients using the HubSpot tool we were able to reduce their Adwords spend from $8,000 per month to $500 per month and still increase their customers coming from Adwords campaigns. Anecdotally I can say that it was much easier for our account managers to execute tactics and strategies on client accounts that were using HubSpot vs. those that were not. So in effect, more got done for those accounts. Did they spend more time on the HubSpot clients? No, actually it was the reverse. We spent more time working on the non-HubSpot accounts because it took much more time to execute anything. This speaks to the efficiency of using a paid tool vs. free tools and gets back to my analogy of building a house with power tools vs. hand tools. I also want to emphasize that I did not go into an exhaustive listing of the HubSpot features and tools. There are many more, including their new Social Media tool. I just touched on the ones we used during this year long study that we believe had an impact on the numbers. The increase in website traffic using HubSpot passes the statistically significant test with 95% certainty. However, the percentage increases in conversions did not pass the statistically significant test with 95% certainty for this test group. Why do I need HubSpot? The HubSpot platform includes tools that cannot be replicated with free software. Tools like Landing Pages, Keyword Opportunity, Competitors, Lead Capturing with Property History, Smart Lists, Smart Content, Marketing Automation, Social Inbox, Lead Scoring and Workflows to list just a few. The integration of the HubSpot toolset under one platform allows you to deploy and measure your online marketing campaigns much more rapidly and effectively than you could without it. If you use free tools like MailChimp and Google Analytics it will take much more of your time than using a single integrated toolset like HubSpot. It will also take more time to achieve your marketing goals. As we saw in this study of 14 companies those 7 using HubSpot out performed those 7 using free tools. All 14 companies engaged in the same inbound marketing program. You need to be comfortable enough to pay for the tool for at least one year, as well as being able to execute an inbound marketing program. The best place to start is with a HubSpot partner agency. They can help you evaluate whether HubSpot would be a good fit for your business goals. Hint - we can do that for you. Are you currently using HubSpot or another similar product? What is your experience with it? I would love to hear from you. Just leave your comment below. Editor's Note: This post was originally published in July 2013 and has been revamped and updated for comprehensiveness.